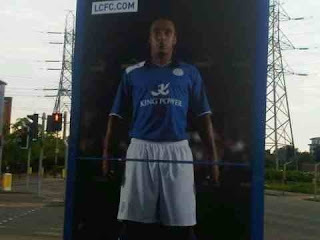 Leicester City's new home kit for the 2012/13 season has been revealed - thanks to the club erecting billboards prior to it's going on sale at 8am tomorrow morning. Spotted by city fan Bert, who posted this picture to twitter, the kit is the first designed for the club by Puma and features the German sportswear company's trademark shoulder stripe in white, against an otherwise entirely royal blue shirt. City will wear white shorts with blue trim to accompany the new home shirt, with the socks apparently in the same royal blue as the shirt. The new kit will be officially unveiled tomorrow when the first team train wearing it at an open training session at the King Power Stadium. Fans will be able to watch Nigel Pearson's men in action - including his four new signings Matty James, Richie de Laet, Jamie Vardy and Marko Futacs - from the family stand, with admission from 10:00-10:45am for an 11:00am start.